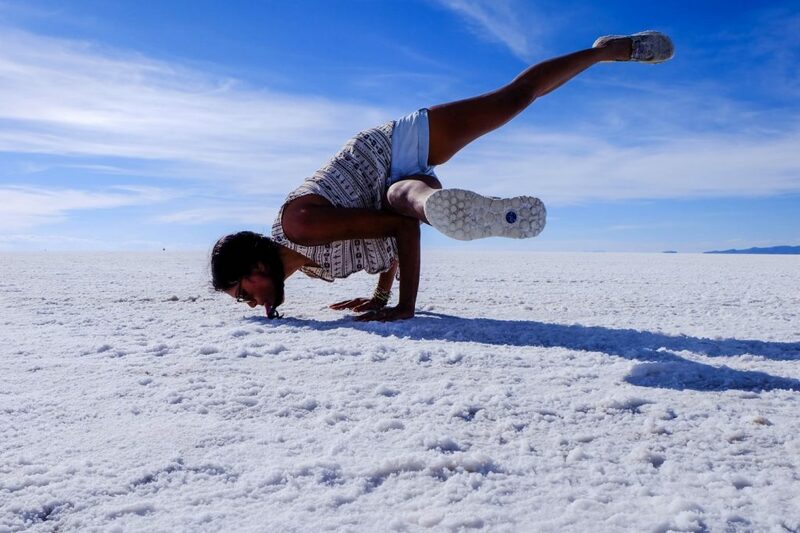 Bolivia's Salt Flats: A 3 Day Salar de Uyuni Tour » Lavi was here. It’s the best feeling ever when a place surpasses your every expectation. 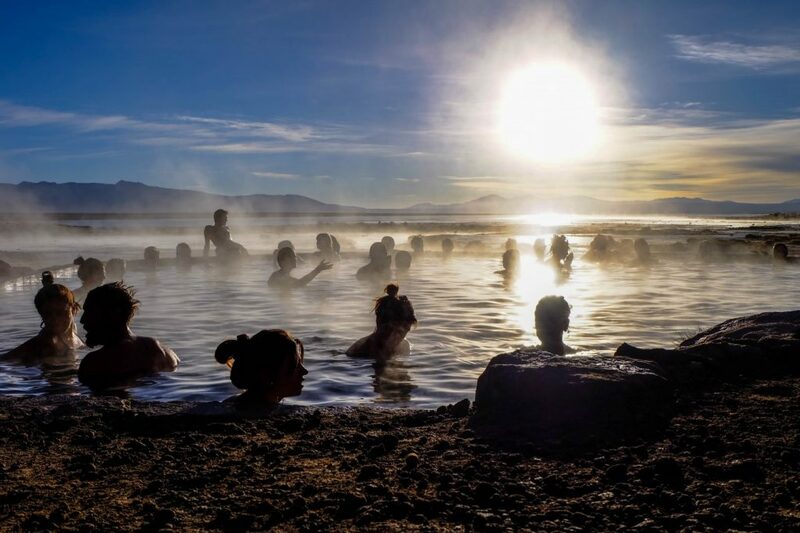 A 3 day Salar de Uyuni tour did exactly that for me. 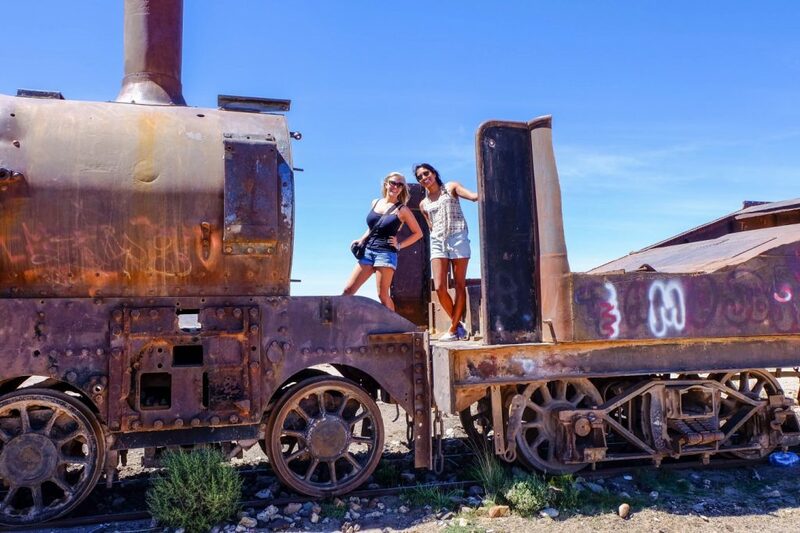 Fresh off the heels of our Death Road mountain biking adventure, Stephanie and I boarded an overnight bus to Uyuni, Bolivia. 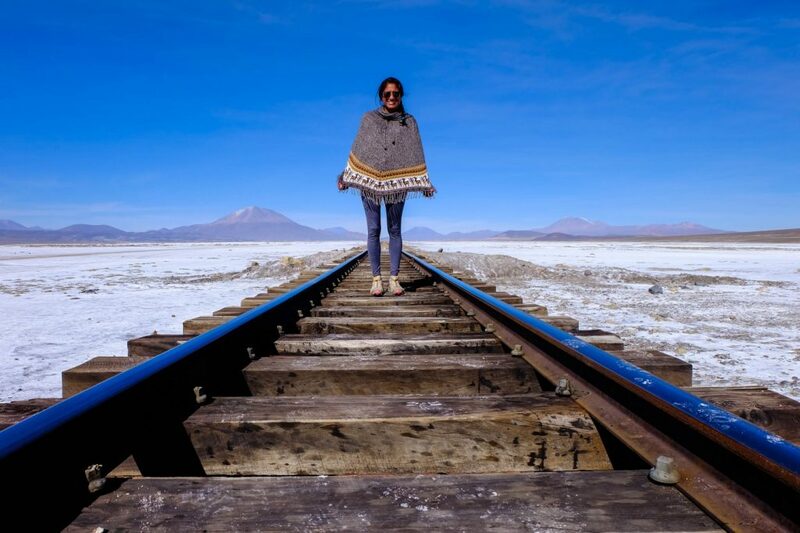 We’d seen countless photos from friends in our La Paz hostel were so excited to finally visit Salar de Uyuni, the iconic salt flats in Bolivia (and world’s largest salt flat). 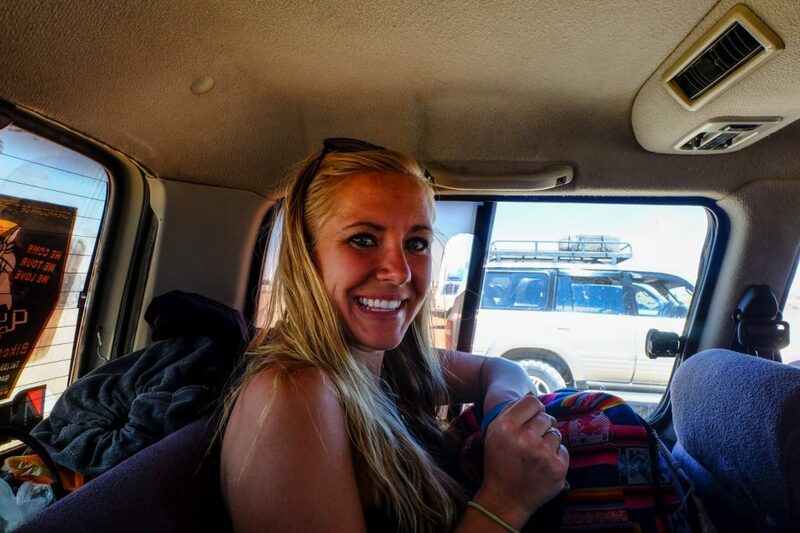 Instead of arriving in Uyuni early the next morning and reserving spots on a tour, we researched beforehand and booked our tour online. Some of our friends didn’t enjoy the tours they’d booked last minute. 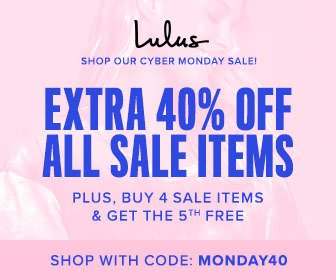 It was important for us to know what we were spending this amount of money on. 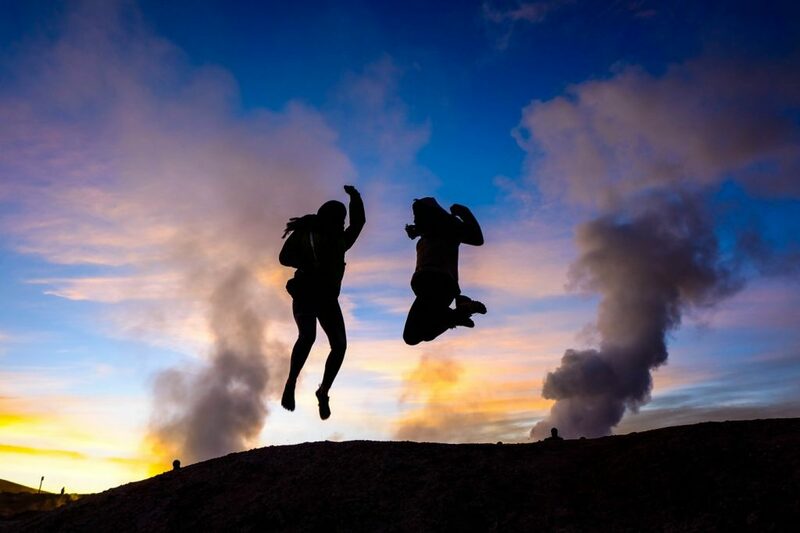 We booked a 2-night/3 day Salar de Uyuni tour with an English guide including extra time in the salt flats to watch the sunset with the company Quechua Connection. We could have booked a cheaper tour in Spanish without the sunset, but we wanted to get the most out of our tour. And we certainly did. I thought we’d stepped into an old western film when we got off the bus into dusty Uyuni. This tiny town was in the middle of nowhere, Bolivia. We made our way to the bodegas, trying to stock up on snacks and toilet paper since our friends explicitly told us we’d be in need of both. We started off our tour by visiting the Train Cemetery. The trains and old tracks used to transport minerals to the Pacific are now old and rusted, but make for a great playground for travelers and photographers. 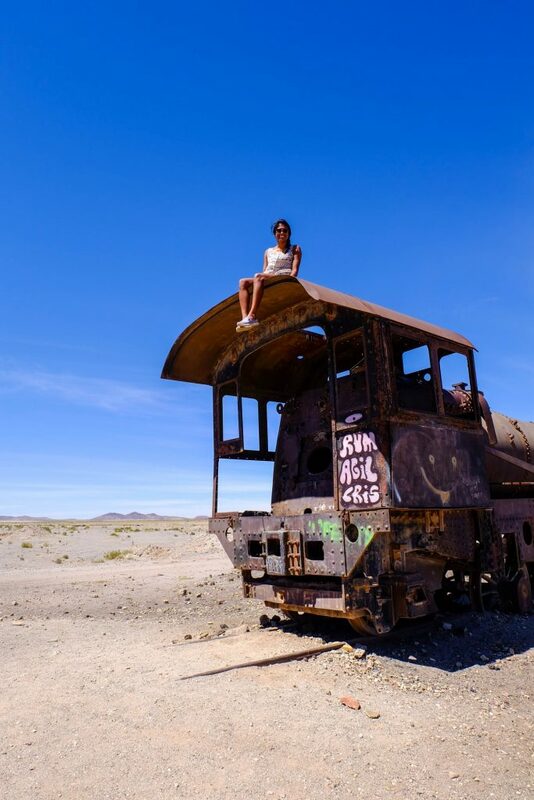 The train cemetery really did feel like the place where South American trains go to die. It was eerie, but awesome. I clumsily climbed a rusty train and scratched my back on my way up, scaring myself into thinking I might need yet another tetanus shot after doing something silly. (It turns out I was probably covered from my last tetanus shot two years ago from a small scooter accident in India). 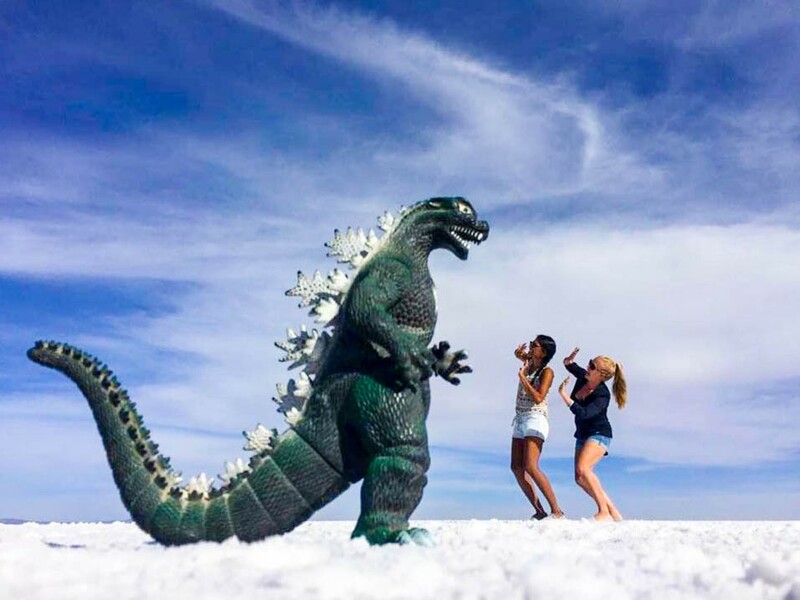 The salt flats tour is definitely an experience that is about the photo ops. It was also great to visit Colchani and learn about how salt is processed. 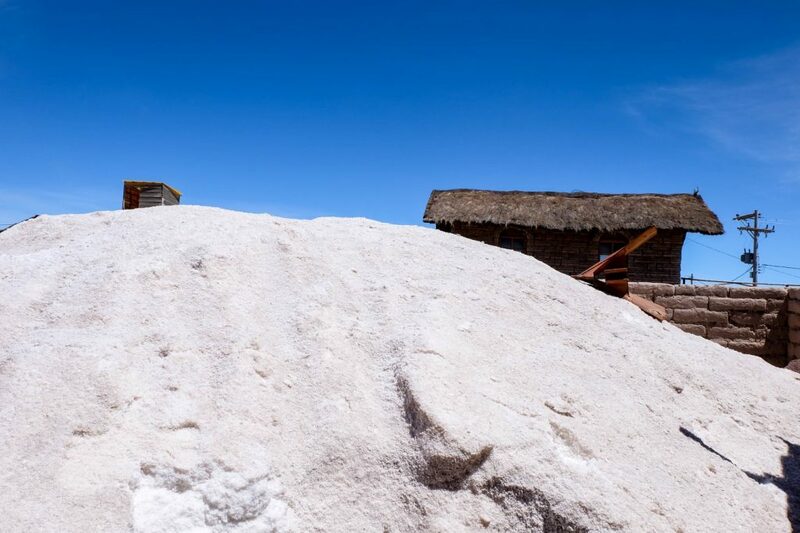 Salt in the flats is scraped into piles shoveled into trucks, cooked in ovens in Colchani, then dried and treated with iodine before it is packaged for sale. 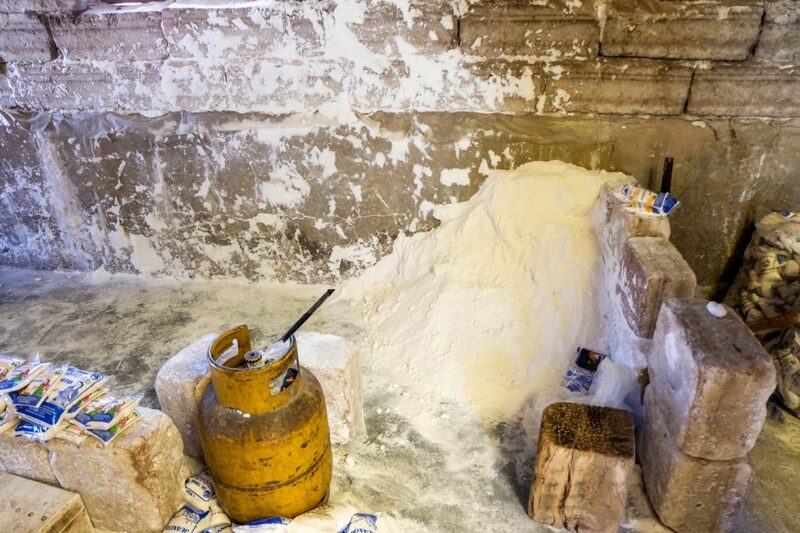 The salt processed in Colchani is primarily exported to other South American countries like Paraguay that are landlocked. 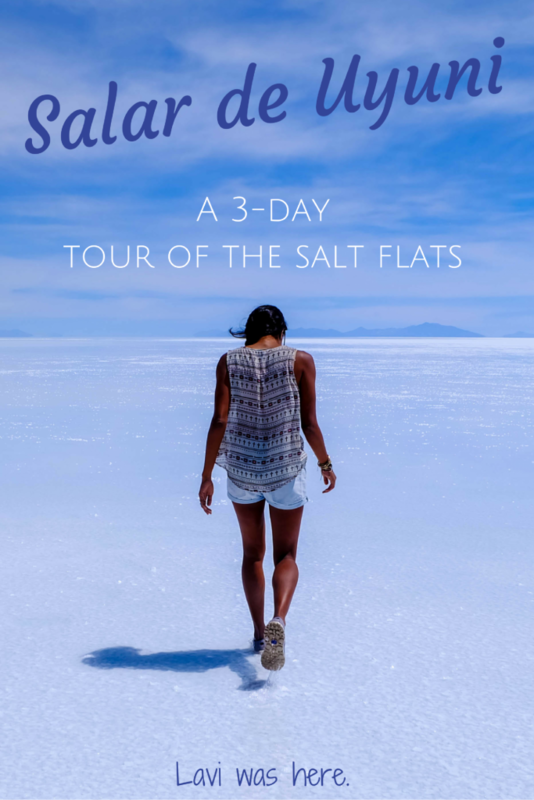 I picked some salt off a mound and had my first taste of Salar de Uyuni salt. So salty! And that’s coming from a girl who loves salt! My eyes widened and my mouth gaped as our vehicle pulled off the dirt road onto the white salt flats. It kind of looked like we were driving on a road covered with a layer of snow, yet it was blazing hot outside in the flats. Driving on an expansive, white flat with only small specks of other vehicles in sight was surreal. Where were we? We drove until arriving to a part of the flats covered in water. 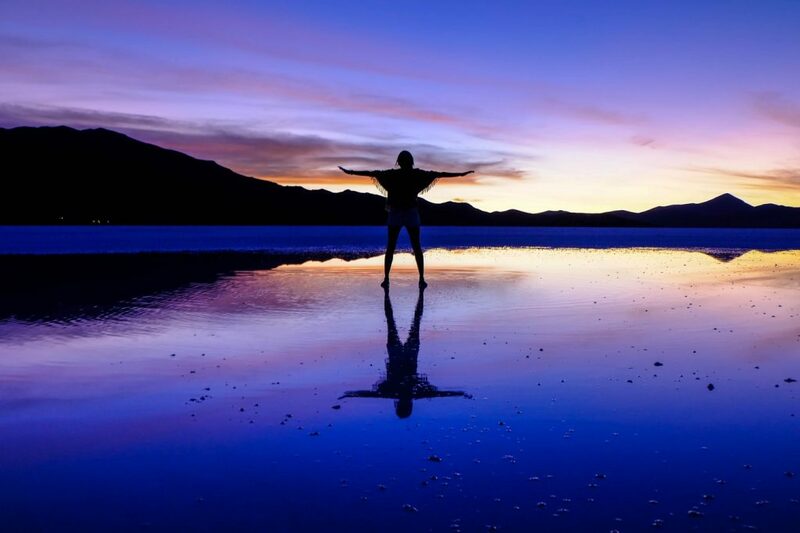 Some lucky travelers get to experience a mirror image effect of the sky on the salt flats when the flats with the water but we weren’t so lucky. The wind couldn’t keep the water still, but Steph and I still had a blast taking photos and jumping around in the puddles. By the end of it, my shoes were soaked in water and my legs were streaked with white salt. One thing I didn’t realize about the tour was that our guides were not only our tour guides, but our chefs too. They set up a table with little stools and passed around plastic containers of food they’d prepared for lunch. The menu every day was basic: quinoa or pasta, salad, and meat (alpaca and chicken). Yes, alpaca. I tried it for the first time and it was actually pretty good, although I did feel guilty about eating a part of that cute animal. Every day we had a different dessert: some unidentifiable pastry that I ate because I’ll try pretty much anything once. With bellies full of lunch, we were dropped off by a bicycle stand. 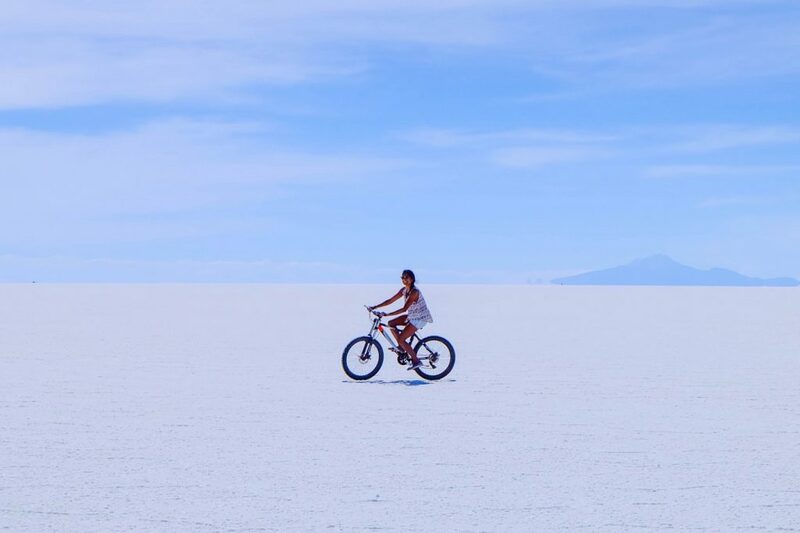 Yes, a bicycle stand in the middle of the salt flats. 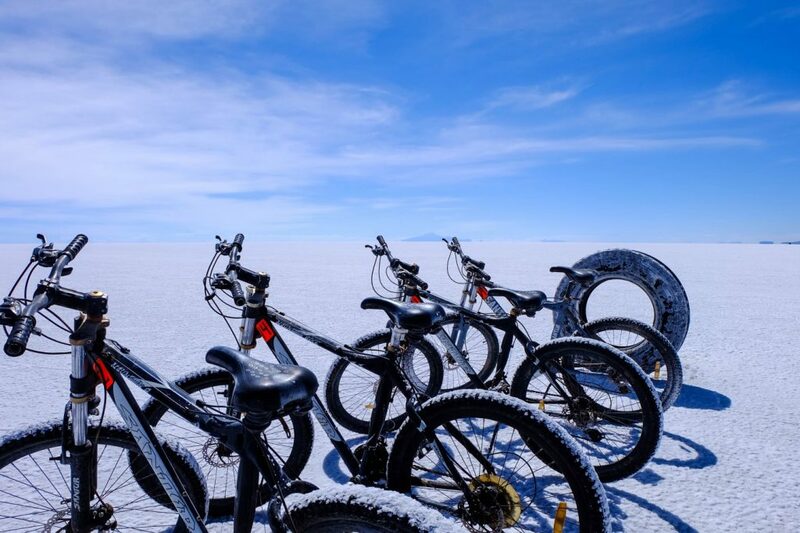 I have no idea where these bikes came from or how the driver even found them in the expansive salt flats, but he pointed to a speck in the distance that was an original salt hotel and instructed us to ride the bicycles there. Steph and I were already pretty sore from our mountain biking ride down the World’s Most Dangerous Road. Still, we jumped on the bicycles and rode toward the hotel. The hotel was like a mirage; it was further away than anticipated and when we thought we were close, we really weren’t. The real fun began when the rest of the group arrived: taking perspective-altering photos. Since the salt flats are really so flat, a small object can look huge by placing it in the foreground and standing further away in the background. We’d seen plenty of photos but didn’t really know what to expect. Our guide had a dinosaur figurine, wine bottle, and Pringles container as props. 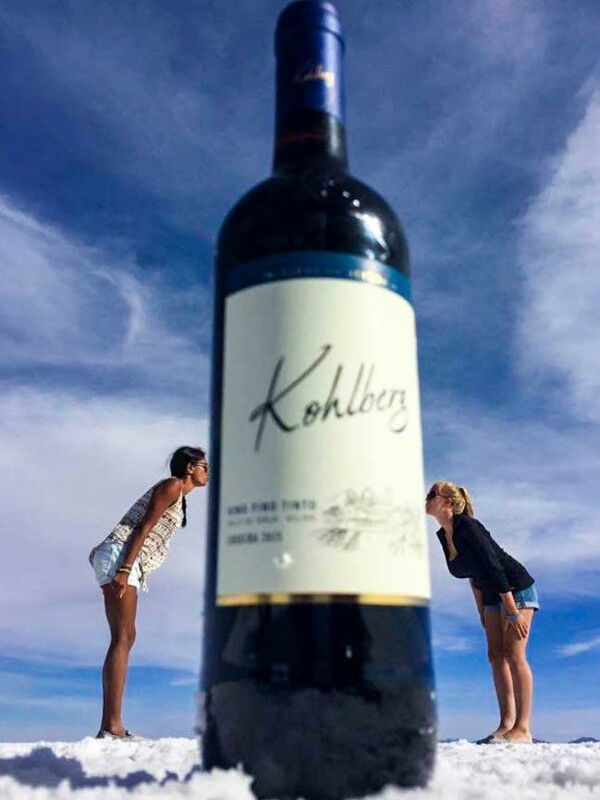 He knew all the best angles and shots so we’d look like we were stepping on the rest of the group, pretending to kiss giant wine bottles, and running away from the dinosaur. The photographer in me wishes that in hindsight I planned out the photos I wanted beforehand. I saw some very creative ones after, but I was still happy with the photos we got. I didn’t expect much from our tour after the salt flats. We came to see the flats and I didn’t think we’d see anything else noteworthy. I realized how wrong I was when we started exploring Isla Incahuasi (Fish Island). This “island” looked so out of place smack-dab in the middle of the salt flats, but actually this piece of land used to be a real island in a prehistoric lake. 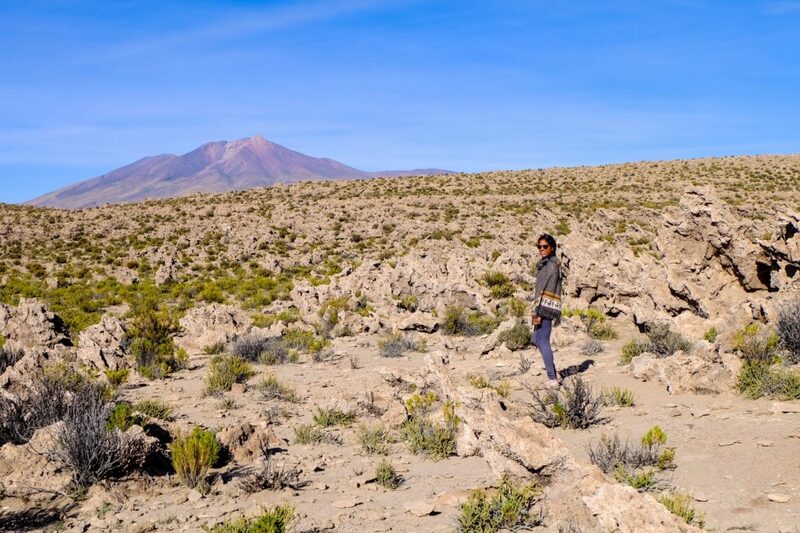 The rocky terrain and furry-looking, yet very sharp cacti on the island made for some really incredible photos. A tire replacement put us behind schedule for sunset. 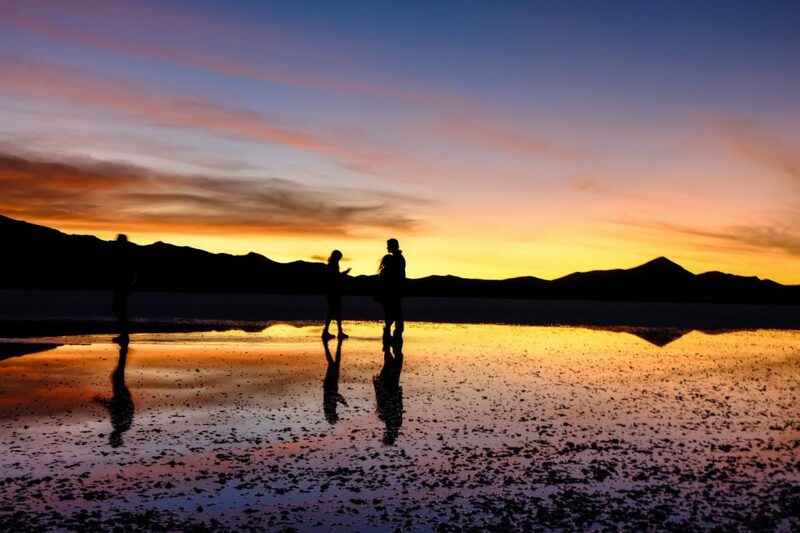 Our driver raced down the salt flats as the sun began to set and the sky filled with color. We all worried we’d miss it and asked if we could just stop and watch the sunset when we arrived to a part of the flats that was covered in water. We had a perfect mirror image of a sky painted with the deepest shades of purple, yellow and orange. I could have pinched myself to see if it was real, it was that stunning. Of our two nights in the Uyuni area, we definitely lucked out the first night in a hotel. Steph and I shared our own room and even had a bathroom. We might have almost gotten electrocuted from the electric shower head, but it wasn’t as bad as we thought it was going to be. Our guides prepared a meal that was probably not as delicious as we thought it was at the time, but our bodies were exhausted from a day in the sun and we would have eaten anything at that point. 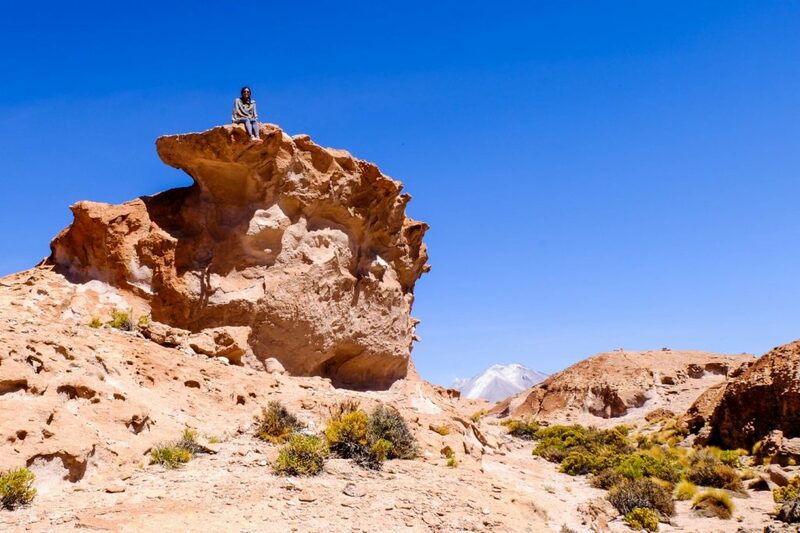 Our second day of the Salar de Uyuni tour took us to a variety of vistas in the area. The rocky area by Ollague was a quick stop to take photos and admire the otherworldly landscape. I’d imagine the landscape on Mars to look very similar, except we did stumble across way too much toilet paper from tourists using the great outdoors as their toilet. I mean, in the middle of nowhere, where else can you go? But I did feel bad seeing all the toilet paper in such a beautiful setting. The train tracks that used to that used to haul salt and minerals to ports on the Pacific Ocean are now a cute photo-op. See that salt next to the tracks that’s kind of brown? The layer is so thin that you can see the dirt underneath. Here is where my curiosity got the best of me and I took it upon myself to taste some of the salt. Again. Laguna Colorada was full of flamingos! 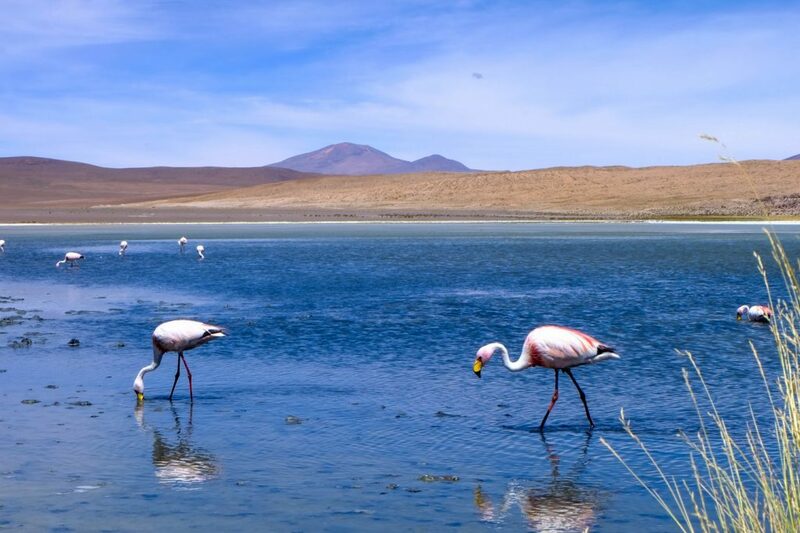 Flamingos in Bolivia aren’t something I thought I’d see, in a place as desolate as Salar de Uyuni nonetheless. Both the Andean and James flamingos stood in the lake and stuck their heads underwater to eat the algae. Laguna Verde unfortunately wasn’t very verde (green). It was too windy for the water to be still enough to have its minerals make the green color pop. No complaints here, though! We were not so lucky in our second night’s accommodation. Six of us in our group crammed into a dorm room. The no frills building had lights but no power outlets or any way to use electricity. Like may places in South America, toilets didn’t come equipped with real toilet seats. I seriously weighed my options before decided to actually use the toilet because it was so dodgy in there. I actually brushed my teeth outside because the clogged sink was a little too gross. One thing I’ve learned in all my travels: no matter what the toilet situation, you have to make it work. Once again we ate like we’d never seen food before, bundled in our ponchos and scarves because it was absolutely freezing. After stargazing on a perfectly unpolluted night, we enjoyed the company of our fellow tour goers. The accommodation might not have been great, but the company of Spanish, Irish, Canadian, and Australian travelers was spot on. I think I fell asleep as soon as I curled up in my sleeping bag liner. (I wasn’t taking any chances; those sheets definitely hadn’t been changed since the previous night’s guests). Before I knew it, we awoke when it was still dark out and piled into the vehicle. 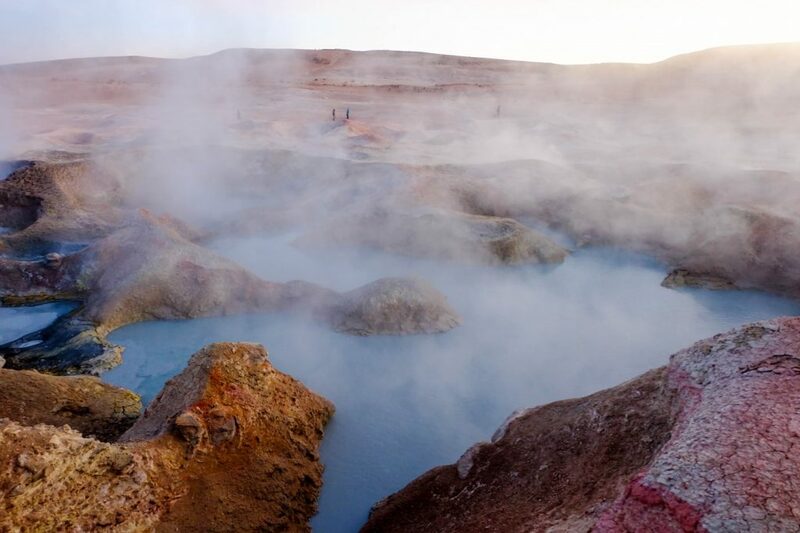 The smell of sulfur hit me before I adjusted my eyes to what I was looking at. 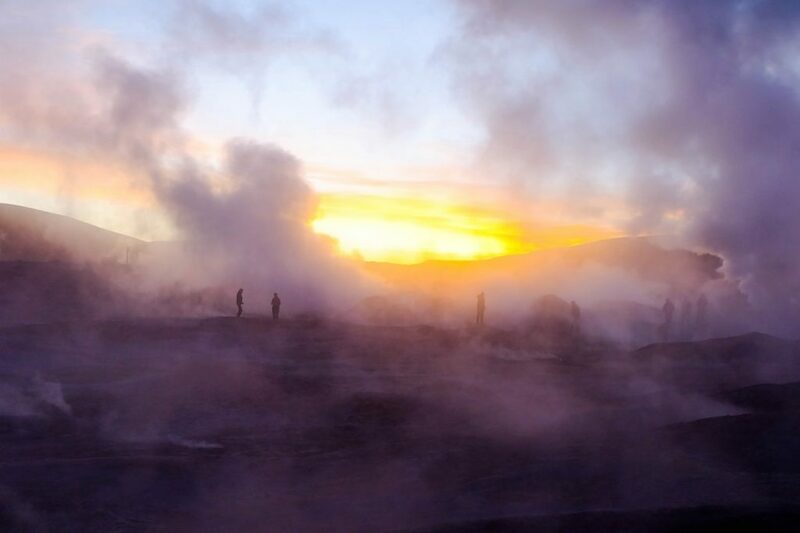 We were in Sol de Mañana amidst pools of boiling mud and steam. Curiosity about the mud pools nagged at me, but I didn’t have the courage to actually touch it – no way! Steam rose from the pools and swirled around the air as the sun rose in the distance. Maybe it was the smell of the sulfur or the mystifying steam, but Sol de Mañana felt kind of enchanting. What a sight to start the day. It still surprises me how a desert can be so hot during the day but also so freezing at night and in the early morning. While I did take some photos at Polques hot springs, I wasn’t about to change into my swimsuit and jump in. The water looked like sweet relief from the cold, but thinking of the aftermath of having to dry off and change when I didn’t even have my towel handy was enough to make me sit back and just enjoy the surroundings. 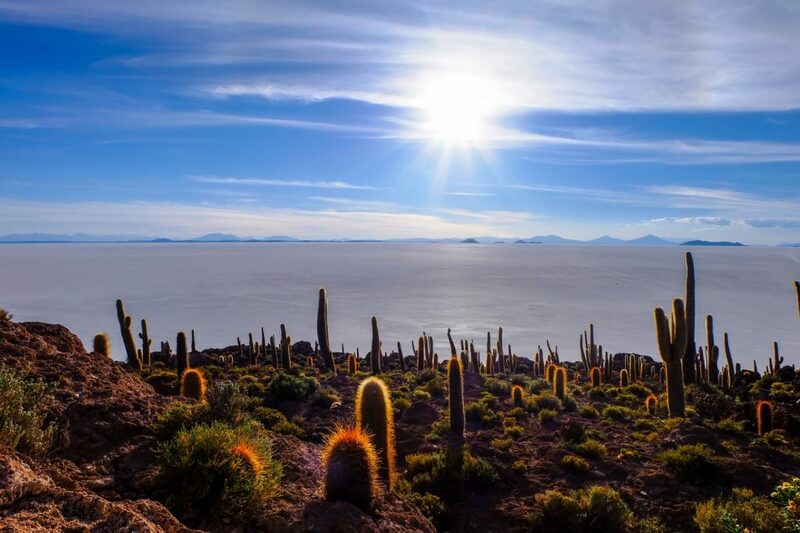 A 2-night/3 day Salar de Uyuni tour was a great way to disconnect from technology and spend some time in the natural beauty of Bolivia. This was a highlight of my entire trip in South America and one of my favorite places on earth. Bring snacks and toilet paper. That just goes without saying. Prepare to not shower. You’re not going to want to once you see the bathrooms anyway, but depending on where you stay, most accommodations make you pay for showers. Pack layers. It gets hot during the day but can also be very windy and nights are freezing cold. Charge your camera/phone and bring extra batteries. 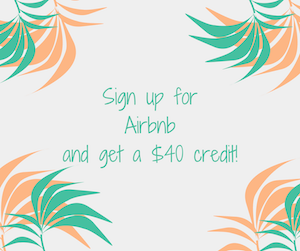 You’d hate to miss out on taking photos of these gorgeous places if you don’t have any plugs in your accommodation to charge anything! Don’t take any chances. Plan your perspective-altering photos. 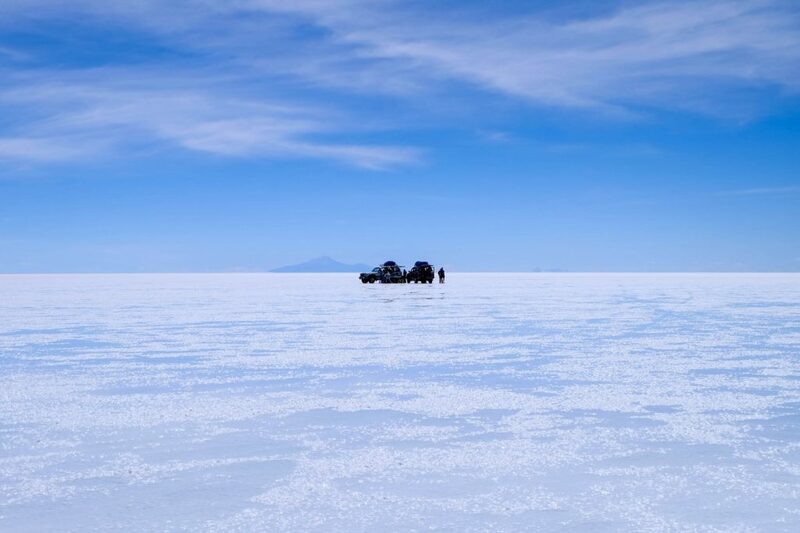 If you want to take specific perspective-altering photos in Salar de Uyuni, plan it out so you know how to set up the shot! You may only visit this place once! 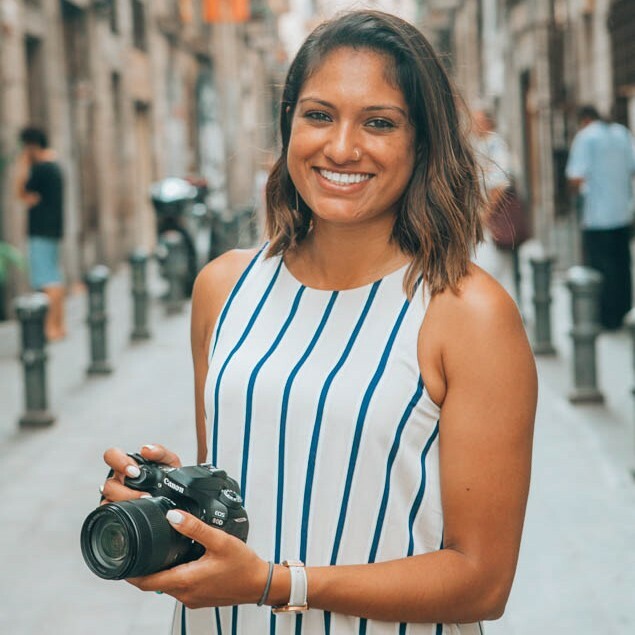 Weigh the options of a Spanish vs. English tour. 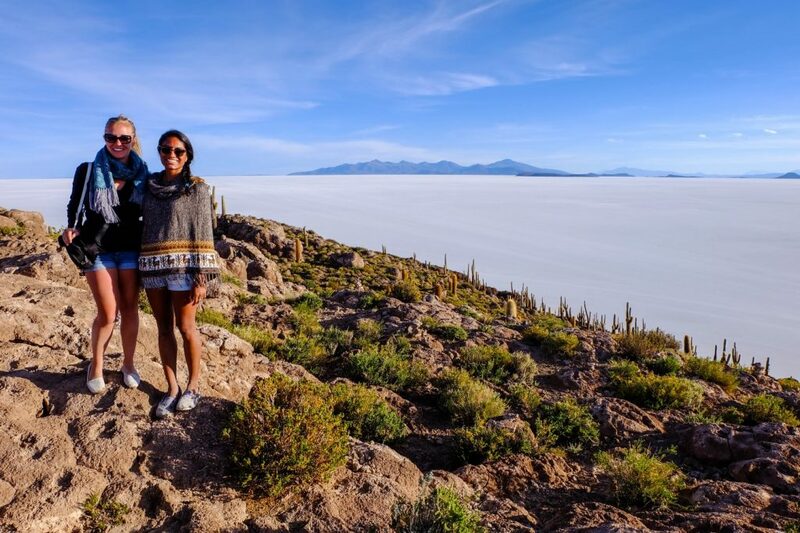 Although Steph and I do speak Spanish, we wanted to make sure we could understand our guide and walk away having learned about Salar de Uyuni. It was well worth it. 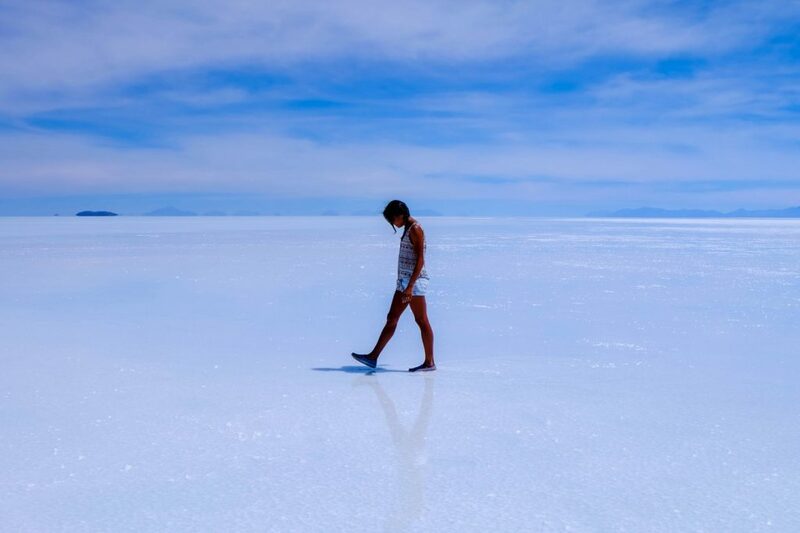 Have you ever been to Salar de Uyuni? Thanks so much for such fabulous and detailed info of your tour! Im heading there in january and this has definitely helped me to plan beforehand. Your pics look great and I will def be following on some of your SM outlets! 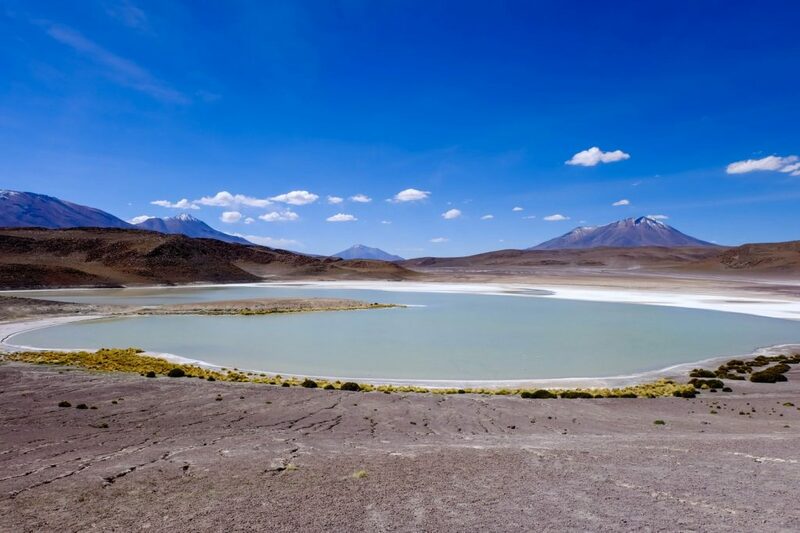 You’re going to have such a great time in Salar de Uyuni! Enjoy, and let me know how it goes!